Working Monday to Friday and having weekends off is very convenient for me as a parkrunner as it means I never have to factor work into my weekend plans. However, the opportunity to work some overtime came up and I fancied doing it. My only proviso was that I would visit a parkrun before heading to work. After a few days of looking at previously unvisited venues to visit, I decided that I wanted to be somewhere in between Dartford (home) and Central London (work) where I could leave my car and complete the journey into Central London by public transport. That meant revisiting a venue, but which one? I considered Lloyd parkrun because its off-road course and hills were exactly what I fancied in the run-up to the cross-country season. 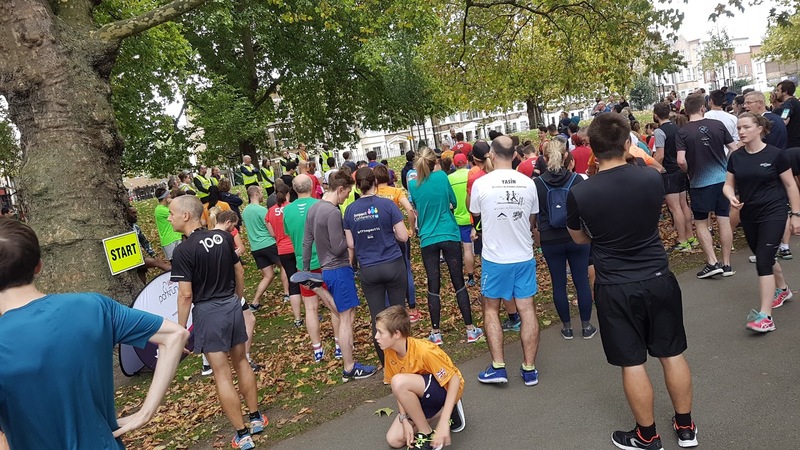 Then I decided that I didn't want too far to travel post-run so I seriously considered Hilly Fields parkrun, which still had the hills but so much off-road in nature and is closer to Central London. Finally, logic took hold and Southwark parkrun made the most sense. I headed out on the Saturday morning, parked near Bermondsey tube station and jogged across to Southwark Park (via Seven Islands Leisure Centre to visit the toilets) for my third visit to this parkrun. The first time I ran here was at the test event where I was first-finisher in a time of 20:02. A few days after that, I ran at the inaugural event and clocked 20:14. Although I hadn't quite been running times as fast as those recently, I was up for the challenge of trying to set a new course best. I knew it'd be a big ask, but there was no reason not to give it a shot. The weather conditions were favourable - it was fairly cool at around 11 degrees and the wind was negligible. Looking at some of the previous sets of results, I noticed that these days the venue attracts a good share of very fast runners, so when lining up on the start line I filtered in a few rows back in order to give the faster people space and to avoid getting dragged out too fast. The course is still the same as it was back at event 1. That means 3 identical flat, anti-clockwise laps with the finish line placed just a little further along the path than the start line to make up the full 5k. With the run briefing done, we were sent on our way. I started out fairly well and settled into my pace nice and early. There were a few people ahead of me that had started at a faster pace than they could maintain and despite a couple of minor hold-ups I pretty much made my way around the first lap in good shape. Back in 2013 I set up a Strava segment for one complete lap (pretty much a perfect mile) and I ran the first lap segment in 6.30 which was a teeny bit fast but still within my desired pacing window. Onto the second lap and the field had spread out nicely. I maintained pretty much the same pace and started to lap people from around half-way around. The second lap segment clocked in at 6.32 which was good but my stomach was tightening and I wasn't sure if I could maintain the pace. I picked up a lot more traffic on the third lap and had to take some corners wider than I would have liked as I lapped other runners. I also had a very minor dog-crossing-the-path incident which broke my stride momentarily, but I quickly got back on pace for the final stretch. After checking my watch on the approach to the finish funnel, I saw that one final hard push might see me dip under 20 minutes, so against all of the messages my body was giving me to slow down, I picked up the pace to a full sprint and crossed the line. The final lap segment came in at 6.34. I stopped my watch with 19:59 showing on the screen, and after having my barcode scanned and thanking some of the volunteers, headed off on a slow trot back towards the car and then onwards to work. The next few hours were quite tense as I desperately hoped that the timer had clicked their stopwatch at the same time as I had clicked mine. A 20:00 dead time is my least favourite time to run. Finally, after what felt like an eternity, the official results were online and I was very happy to see that I had been officially timed at 19:59. I hadn't run a sub-20 parkrun for over six months, so it was a great feeling being back in the teens. I seriously haven't been this pleased with a result for a long time, so that set me up for a very decent weekend!